The Mediterranean was the cradle of European civilization and offers the most amazing diversity in terms of history, scenery, culture and food. There are so many great places to stop and visit, that you can do a Mediterranean yacht charter every year for the rest of your life without going to the same place. Here is just a few of the highlights, but please contact us for more information. Croatia’s coastline along the Adriatic Sea is hundreds of miles long and with over 1100 islands. It has been the playground of the ruling classes since European civilization began, and with good reason. The Roman emperor Diocletian built a beautiful palace in the town of Split more than 1700 years ago and most of it is still intact. Another gem is the 800 year old Venetian town on the island of Korcula, almost untouched by the time. The sailing in Croatia is fantastic and the sheltered waters and the prevailing wind direction makes it a great destination for your first yacht charter in the Med. The South of France offers very sophisticates shopping and dining opportunities, but there is also a more rural side to it. 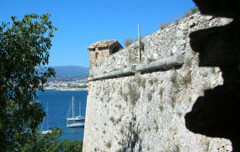 80 miles to the south lays the famous island of Corsica, birthplace of Napoleon. Many places are still untouched and there are small and interesting towns. The Italian island of Sardinia is only a couple of miles further south and it has a stunning nature. The Prince Aga Khan started to develop the northeast corner – Costa Smeralda – in the 1960’s and it is today a meeting place for high-end European charter yachts. 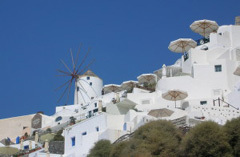 Cruising the Greek islands is always an amazing experience no matter where you go. In some of the smaller islands life has not changed much in the last 100 years, but other places are developing quickly. The light has a special translucent quality and sipping a drink in the cockpit of you luxury crewed charter yacht at sunset, you will see for yourself! After relations has normalized between Turkey and Greece it is now possible to sail the short distance to the Turkish coast, combining it with your Greek yacht charter. Chartering in the Med is a great adventure anywhere you go. You will probably spend lots of time ashore exploring, shopping, sightseeing and trying out the local cuisine and for this reason the charter rates for crewed yachts are mostly based on a “plus all expenses” basis. The Mediterranean sailing season is fairly short, beginning in June and ending in October, with July and August as absolute peak season. Temperatures can soar to 100 degrees F, but it is mostly dry and comfortable. To help you find a yacht in the different destinations, we have installed this search engine which has many features. However, locations of the yachts and other things can easily change, so please contact us for confirmation and further information.